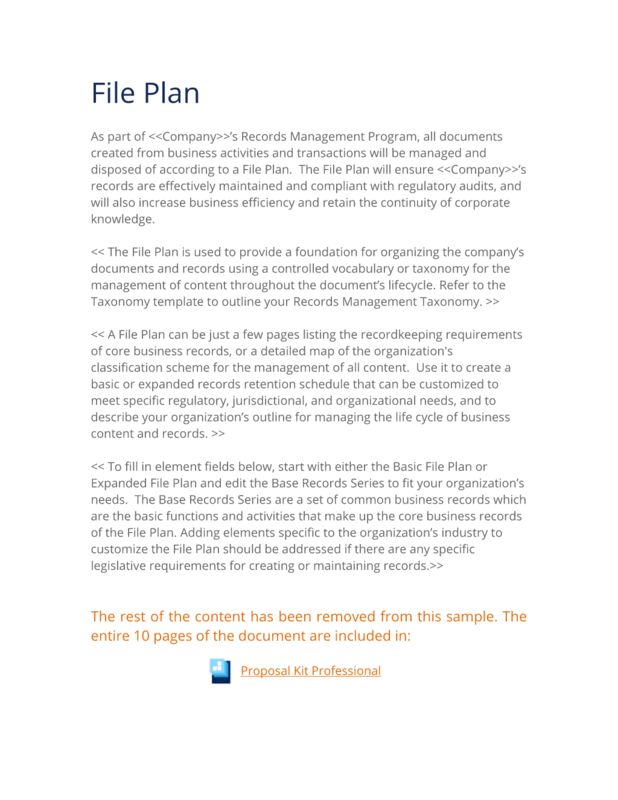 Use the Records Management Expanded File Plan Template to provide the basis for organizing the company's documents and records using a controlled vocabulary or taxonomy to manage the document's lifecycle from creation to disposition. Typically the File Plan is created as part of the collection of documents for the entire Records Management Program. This Records Management Expanded File Plan Template is included in an editable format that can be customized for your own needs. As part of Company Name's Records Management Program, all documents created from business activities and transactions will be managed and disposed of according to a File Plan. The File Plan will ensure Company Name's records are effectively maintained and compliant with regulatory audits, and will also increase business efficiency and retain the continuity of corporate knowledge. The File Plan is used to provide a foundation for organizing the company's documents and records using a controlled vocabulary or taxonomy for the management of content throughout the document's lifecycle. Refer to the Taxonomy template to outline your Records Management Taxonomy. A File Plan can be just a few pages listing the recordkeeping requirements of core business records, or a detailed map of the organization's classification scheme for the management of all content. Use it to create a basic or expanded records retention schedule that can be customized to meet specific regulatory, jurisdictional, and organizational needs, and to describe your organization's outline for managing the life cycle of business content and records. To fill in element fields below, start with either the Basic File Plan or Expanded File Plan and edit the Base Records Series to fit your organization's needs. The Base Records Series are a set of common business records which are the basic functions and activities that make up the core business records of the File Plan. Adding elements specific to the organization's industry to customize the File Plan should be addressed if there are any specific legislative requirements for creating or maintaining records. The Basic File Plan retention schedule categorizes documents and records into Record Series that group together documents by common functions and activities. The Description is the activity or transaction source of the document. The Medium is the physical attribute of the document, and Retention Period is the suggested time to keep the record to disposition. RECORDS SERIES ADMINISTRATION DESCRIPTION MEDIUM RETENTION PERIOD The Administration records series relates to the performance or management of business operations and the making or implementing of decisions, and includes a wide variety of general administrative matters. Company's minute book Electronic 7 years Board and Board Committee materials Electronic Indefinitely Corporate policies Electronic Indefinitely add record category descriptions, add medium, add retention, add record category descriptions, add medium, add retention, ASSET AND FACILITY MANAGEMENT Asset and Facility Management relate to the management and maintenance of equipment, vehicles, facilities and buildings. DESCRIPTION MEDIUM RETENTION PERIOD Equipment and vehicle management (i.e., equipment and system documentation, leasing, usage, salvage, disposition). Paper, electronic 6 years after the equipment or system is disposed of or replaced. DESCRIPTION MEDIUM RETENTION PERIOD Accident reports and claims Paper, electronic Expiration + 7 years Contracts Paper, electronic Expiration + 7 years Legal actions and issues Paper, electronic Expiration + 7 years. DESCRIPTION MEDIUM RETENTION PERIOD Accounts payable ledgers and schedules Paper, electronic 7 years Accounts receivable ledgers and schedules Paper, electronic 7 years Invoices Paper 7 years Payroll Electronic 7 years. DESCRIPTION MEDIUM RETENTION PERIOD I-9 forms Image electronic 1 year after termination Employee personnel records Paper and electronic 7 years (after termination) Resumes Paper and electronic 3 years W-2, W-4 forms Image electronic 4 years. DESCRIPTION MEDIUM RETENTION PERIOD Manuals, warranties, maintenance logs, and any other records documenting the operation and use of IT hardware and software Paper and electronic After the equipment or system is disposed of or replaced. DESCRIPTION MEDIUM RETENTION PERIOD Sales reports Electronic Create date plus 7 years Case studies, brochures, advertisements, flyers, catalogs, pre-sales literature Electronic Create date plus 7 years. The Expanded File Plan categorizes the records metadata in a scheme for increased accuracy and control. The metadata fields for vital or historical records, location of content, and identifying the owner of records improve governance and demonstrate compliance to regulatory audits and controls. Organizations with high risk of litigation and large volumes of content should use the Expanded File Plan Template. Vital records require special protection, such as redundant backups, and refer to the set of records that are critical to the organization's existence. Historical records may have great importance in the future and need to be retained most often indefinitely. The Cut-Off field is the condition that triggers the countdown for Disposition. Defining the location of stored content across the enterprise will direct the disposition authority or researcher to the location of the object for disposition or discovery. Cataloging the personnel responsible for the authorization of the disposition of the content demonstrates that the organization's Records Management Program is managing the complete lifecycle from creation to destruction. ADMINISTRATION - The Administration records series relates to the performance or management of business operations and the making or implementing of decisions, and includes a wide variety of general administrative matters. RECORD TITLE AND DESCRIPTION MEDIA TYPE DEPT VITAL RECORD. (Y/N) CUT-OFF DISPOSITION REGULATORY REFERENCE STORAGE CONTACT Company's minute book Electronic Admin N N Date created 7 years Department policy Network file share server name CEO Board and Board Committee materials Electronic Admin N Y Date created Indefinitely Department policy Network file share CEO Corporate policies Electronic Admin Y Y Date created Indefinitely Department policy Network file share CEO add record category descriptions, add record category descriptions. ASSET AND FACILITY MANAGEMENT - Asset and Facility Management relates to the management and maintenance of equipment, vehicles, facilities and buildings. RECORD TITLE AND DESCRIPTION MEDIA TYPE DEPT VITAL RECORD. (Y/N) CUT-OFF DISPOSITION REGULATORY REFERENCE STORAGE CONTACT Equipment and Vehicle Management (i.e., equipment and system documentation, leasing, usage, salvage, disposition). Paper and electronic Audit N N Expire or superseded 6 years after the equipment or system is disposed of or replaced Department policy File cabinet and network file share CFO add record category descriptions, add record category descriptions. LEGAL RECORDS - Records related to litigation and legal issues. RECORD TITLE AND DESCRIPTION MEDIA TYPE DEPT VITAL RECORD. (Y/N) CUT-OFF DISPOSITION REGULATORY REFERENCE STORAGE CONTACT Accounts payable ledgers and schedules Paper, electronic Acct. N N Date created 7 years Department policy Electronic Content Management System CFO Accounts receivable ledgers and schedules Paper, electronic Acct. N N Date created 7 years Department policy Electronic Content Management System CFO Invoices Paper Acct. Y Y Date created 7 years Department policy Content Management System CFO Payroll Electronic Acct. Y Y Date created 7 years Department policy Electronic Content Management System CFO add record category descriptions, add record category descriptions. HUMAN RESOURCES MANAGEMENT - Records relating to managing the company's workforce, including but not limited to benefits, labor relations, misconduct/discipline/grievances, occupational health and safety, performance management, personnel, position development/staff structure, recruitment/hiring, staff development and training. RECORD TITLE AND DESCRIPTION MEDIA TYPE DEPT VITAL RECORD. (Y/N) CUT-OFF DISPOSITION REGULATORY REFERENCE STORAGE CONTACT I-9 forms Image electronic HR N N Employee termination 1 year Dept. Policy File cabinet and network file share Director HR Employee personnel records Paper and electronic HR N N Employee termination 7 years Dept. Policy File cabinet and network file share Director HR Resumes Paper and electronic HR N N Date created 3 years Dept. Policy File cabinet and network file share Director HR W-2, W-4 forms Image electronic HR N N Date created 4 years Dept. Policy File cabinet and network file share Director HR add record category descriptions. INFORMATION MANAGEMENT - Records related to the management of automated information systems and the administration of computer applications and electronic data. RECORD TITLE AND DESCRIPTION MEDIA TYPE DEPT VITAL RECORD. (Y/N) CUT-OFF DISPOSITION REGULATORY REFERENCE STORAGE CONTACT Manuals, warranties, maintenance logs, and any other records documenting the operation and use of IT hardware and software Paper and electronic IS N N After the equipment or system is disposed of or replaced 1 year Dept. policy Network file share CTO add record category descriptions, add record category descriptions. SALES AND MARKETING MANAGEMENT - Records and reference material about the company and its products and/or services. RECORD TITLE AND DESCRITPION MEDIA TYPE DEPT VITAL RECORD. (Y/N) CUT OFF DISPOSITION REGULATORY REFERENCE STORAGE CONTACT Sales reports Electronic Sales N N Date created 7 years Dept. Policy Network file share Director of Sales and Marketing Case studies, brochures, advertisements, flyers, catalogs, pre-sales literature Electronic Marketing N Y Date created 7 years Dept. Policy Network file share Director of Sales and Marketing add record category descriptions, add record category descriptions. The editable Records Management Expanded File Plan Template document - complete with the actual formatting and layout is available in the retail Proposal Kit Professional.